Oscar Wilde, by all accounts, was a dazzling conversationalist. He could entrance an audience with his quick wit and dazzling wordplay. He had the air of an actor who enjoyed being dazzled by the limelight, wearing outrageous outfits with equally outrageous opinions to boot. He was a sublime writer. Whilst his poetry may have been overshadowed by his contemporaries, his novels, critical writings and dramas were highly regarded. The Importance of Being Earnest is possibly his best known and best loved work. 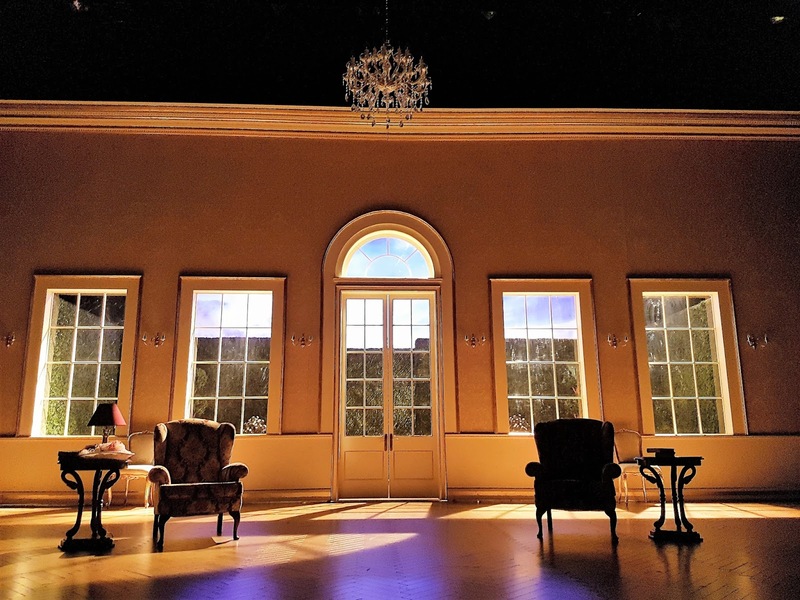 With such a well-known play the anticipation of the audience is higher than that of a new, or lesser known play. The cast and creatives therefore have to work a lot harder to satisfy the demands of their audience and at Theatr Clwyd, the costume and props department have excelled themselves. Wilde’s original play was written in four parts, however the producer wished for it to be reduced to the three act play that we are familiar with today. It is an irreverent look at the social aspects of Victorian society, whilst many of the lines are delivered tongue in cheek, there is a dark resonance to them. In fact, before Wilde died he noted that whilst he was pleased with the happy tone of the play, he wished that it was taken more seriously. Turning this play into the more solemn, serious message that Wilde inferred to would not have worked, but when you look at the play as a whole, you can see that the multi layered comedy has a serious message to deliver. 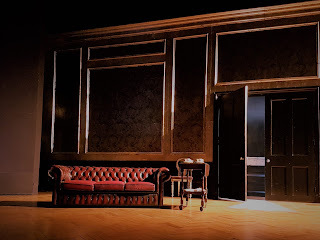 Act One is set in the Morning Room of Algernon’s flat in Half Moon Street, London. There is a feeling of space and youthful vitality; a lust for life and gay abandon. Algernon’s friend, Ernest Worthing is in love with Algernon’s cousin, Gwendolen. Gwendolen is in love with Ernest. The only problem is, Ernest is not really his name, his name is Jack, and Gwendolen could never love someone called Jack. Algernon finds Jack’s cigarette case, inscribed "From little Cecily, with her fondest love to her dear Uncle Jack." Jack’s secret is out and he is forced to admit to Algernon that he is known as Jack in the country, and has a young ward, an heiress called Cecily. In order that he may make frequent visits to London, he tells his ward he has a no good brother, Ernest, who lives in London. But Jack, to those who know him in London, he is known as Ernest. Algernon is amused and admits he also lives a duplicitous double life. He has an imaginary friend, the invalid Bunbury, who lives in the country. Every time Algernon wishes to avoid any social engagements, he uses Bunbury as an excuse so that he can visit the country. The mood quickly changes the moment Lady Bracknell (Aunt Augusta) sweeps into the room with Gwendolen. 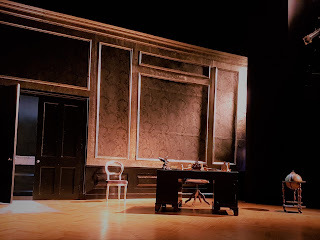 Upon hearing that Jack has proposed to Gwendolen, Lady Bracknell interrogates poor Jack, unimpressed that his London flat is on the “wrong” side of Belgrave Square. Upon discovering that he was in fact adopted, having been found in a handbag at Victorian Station, she is positively apoplectic and forbids any thought of marriage between him and Gwendolen. Gwendolen has other ideas though, and as Jack gives her his address in the country, Algernon covertly makes a note of the address in order that he may make acquaintance with the wealthy ward, Cecily! 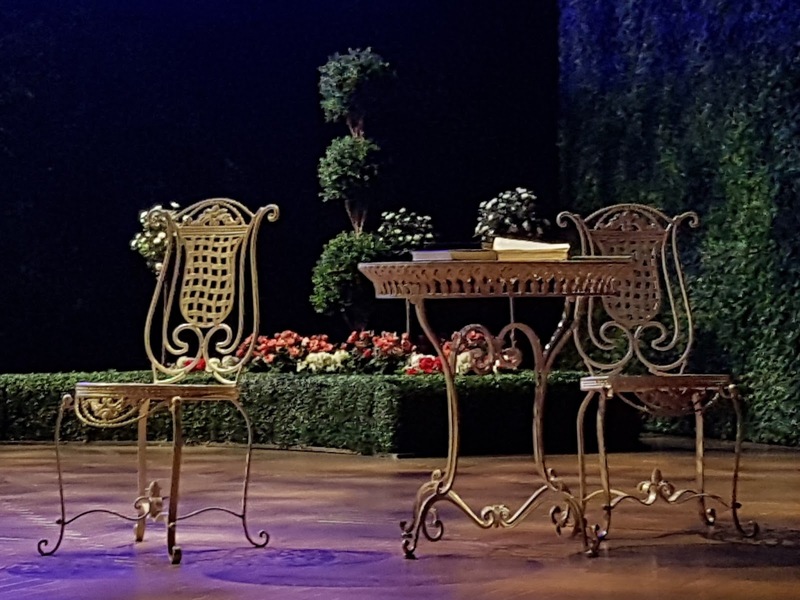 Act one ended in a perfectly synchronised dance as actors waltzed around the stage moving furniture out of the way to showcase a manor house garden for the next act. 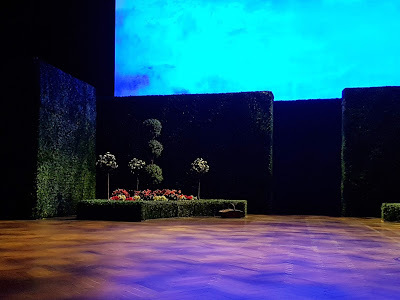 The stage just seemed to go on forever, with high, elegantly clipped hedges, and perfectly manicured rose gardens. Cecily is in the garden with her governess Miss Prism when Canon Chasuble arrives. It is evident that he is fond of Miss Prism, and she, shyly, is fond of him. This was a time when social etiquette was paramount. A single woman must never be seen walking alone with a man, she should be chaperoned by an older married man, otherwise her reputation would be in ruins. Behind closed doors however, Cecily actively encourages Miss Prism and Canon Chasuble go for a walk together through the gardens! Cecily is fascinated by the tales she has heard about Jack’s brother Ernest. Ernest has just arrived at Jack's house with an enormous amount of luggage in tow. The only problem is, Ernest is not really his name, his name is Algernon, and Cecily could never love someone called Algernon. Just like Gwendolen, Cecily is fond of the name Ernest. It might seem ludicrous to think that someone would cut short an engagement because the name is wrong, but as Wilde shows, it is no worse than marrying someone for their social standing or their wealth. All of these acts are just mercenary, and make a mockery of the ideal of marriage. Jack has become bored of leading a double life and decides he will “come clean” by returning home and announcing that his poor brother has died. Imagine his surprise to find his “dead” brother in the garden being entertained by Cecily! Gwendolen has run away to the address Jack gave her in Algernon’s flat. The boys have disappeared and so she meets Cecily in the garden. Initially they are friends, saccharinely sweet with each other, until it becomes apparent that they are both engaged to ‘Ernest’. Their mood quickly chills, and Robyn Cara (Cecily) and Emma Denly (Gwendolen) must have taken great delight in spitting their venomous lines at each other. I thoroughly enjoyed the wickedness Cecily showed as she deliberately placed the contents of the sugar bowl into Gwendolen’s tea; Gwendolen having made it clear that the fashionable classes don’t take sugar in their tea! 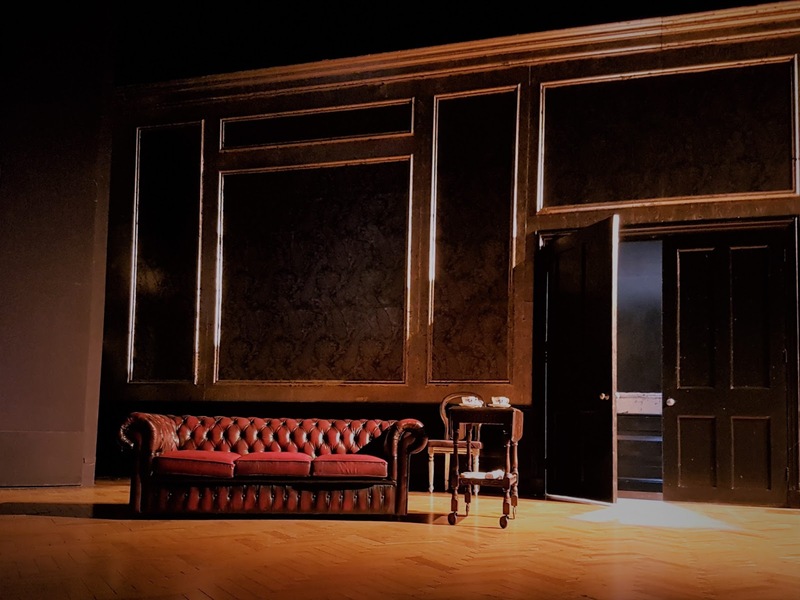 It is only when Algernon and Jack reappear that they realise their lies have been uncovered, and that Gwendolen and Cecily are livid that they have been deceived. 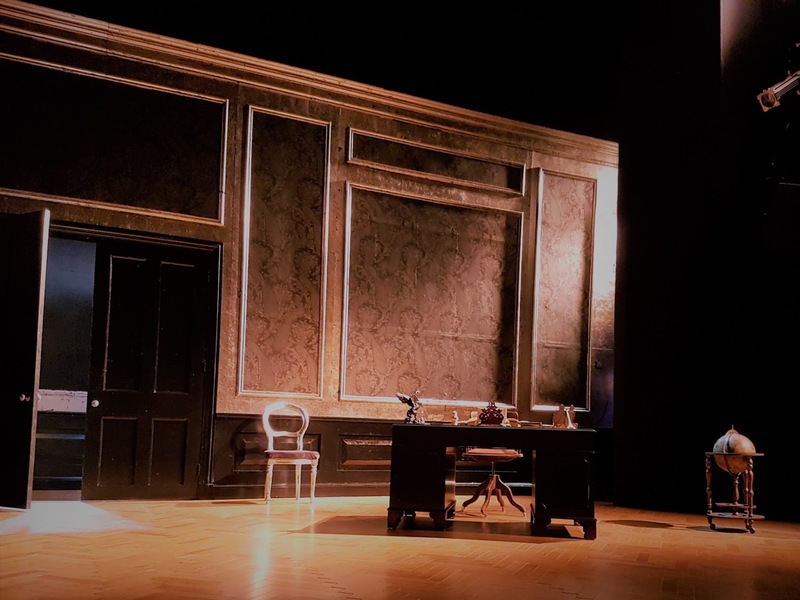 The success of the play lies in the ability of the actors to play the most absurd lines with perfect gravitas and earnestness, whilst they are conscious at how ridiculous it all is. They must appear sincere, and this cast nailed this perfectly. The whole evening was a masterclass in “eye acting,” where an actor can just use their face to portray what they are thinking without uttering a word. Hilary Maclean as Lady Bracknell and James Backway as Algernon had this down to a fine art. Another technique employed throughout was interrupting any sentimentality by eating sandwiches and muffins. This was shown is glorious technicolour as Act Two ended with a magnificent bun fight…it was just a shame that none of those muffins headed in my direction. I do love muffins, especially if slathered in butter! Act Three took place in the morning room at the manor house. The audience is once again transported into a glamourous adaptation of yesteryear as a chandelier descends into a relatively informally furnished room which looks out to the garden. Gwendolen and Cecily are not speaking to Algernon and Jack. They will maintain a dignified silence. The boys will be repentant. The production values in this play are second to none. Throughout there is great attention to detail, but it is the tiny nuances that really give the play depth. In order to show that they don’t wish to speak to the men, Gwendolen and Cecily decide they will pretend to be engrossed in their books. Gwendolen stands, holding her book at arm’s length and as the boys walk into the room she realises the book is upside down and swiftly turns it the correct way up. At length she realises this is an uncomfortable pose, and uses her other arm to prop her reading arm up! The boys will be ignored at all costs. It is not long before the formidable Lady Bracknell arrives in pursuit of her errant daughter. She is flabbergasted that Algernon and Cecily are engaged, but she is swiftly satisfied that all is well with the engagement when she realises Cecily has a large trust fund. (Perish the thought that someone might actually marry for love!) The only fly in the ointment is Jack, as Cecily’s guardian forbids the marriage. If he can’t marry Gwendolen, Cecily is not marrying Algernon. Lady Bracknell is unremoved on the subject, and so it falls to the deferential Miss Prism, will she be able to save the day? Oscar Wilde’s comedy is a social satire with scathing one liners about the absurdity of marriage and the living of double lives. It is a story which is both entertaining, but also heart rending, about friendships and finding out about who you really are; where you really come from. Wilde stands back from the crowd and the moral codes of the era and takes in this panoramic view of what actually went on in upper class society. Wilde’s wit and wisdom is brought to life by actors who give a great physicality to their characters. The humour wavers between satire and slapstick, and despite the play running for 2.5 hours, the comedic value alone makes the play run swiftly. There is not one minute where you find your mind wandering. It is an enthralling night out watching Wilde’s acerbic take about Victorian motivations for marriage. The play runs until the 27th May 2017 and it is a fantastic revival of an all-time classic. Tormented Teens, Head Demons & Wooden Willies!